For I am convinced that neither life nor death, neither angels nor demons, neither the present nor the future, nor any powers, neither height nor depth, nor anything else in all creation, will be able to separate us from the love of Christ that is in Christ Jesus our Lord. For those God foreknew he also predestined to be conformed to the likeness of his Son … [a]nd those he predestined, he also called; those he called he also justified; those he justified, he also glorified. 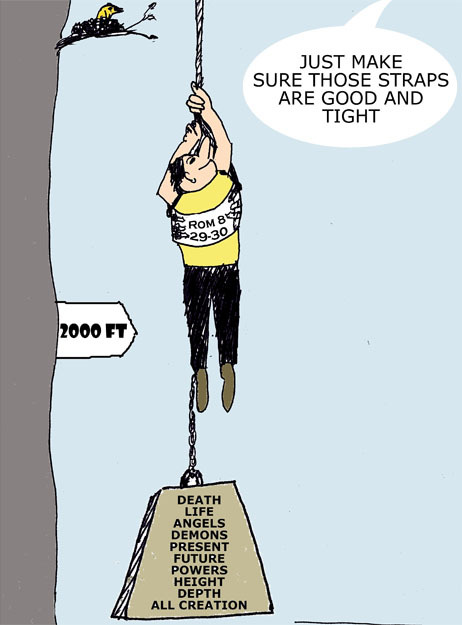 The thought of this verse as a golden chain of salvation (as opposed to an air-sea rescue harness) goes back to Beza. It has been much argued against since Arminius on lingusitic and theological grounds. But this seems to me a case where the picture tells the real story. Since what you’re getting after is Perseverance of the Saints, Arminius was agnostic, he wasn’t quite sure what Scripture said on this matter since you have confidence and you also have verses in Hebrews about persevering. The thing you do include in your picture is that the fellow, though wrapped in Romans 8, is still climbing. 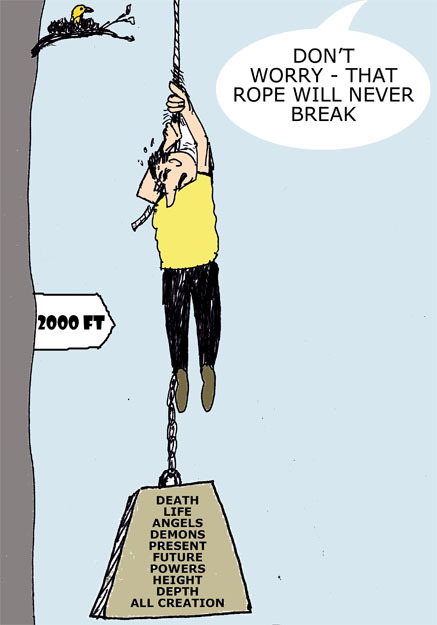 The opposite folly is saying, “well I’m ok!” and letting go of the rope (that’s OSAS). Everytime we doubt, Paul would’ve said “Look at Christ!”, I think both Arminius (Beza’s former student!) and Calvin would’ve both nodded. I wasn’t disputing that Arminius (or at least the Remonstrants) left perseverance open “for further investigation of the Scriptures”. But I have it on good authority that Arminius disputed the specific “golden chain” interpretation of Romans 8.28 by Beza, followed by Perkins etc.